When I saw the rich blue flowers of Anchusa ‘Dawn Mix’ featured in the catalogue, I knew I would soon be parted from my buck and a quarter. Anchusa photo courtesy of Pinetree Garden Seeds, http://www.superseeds.com. Seed catalogue writers and designers know what they are doing. What gardener can resist any blue flowers, let alone those so sumptuously saturated? I am assured of having some pink and white flowers as well (the ‘mix’ part), but it’s the blue flowers that sell me. Anchusa, or bugloss, is a borage relative native to Europe, West Asia, and Africa. The variety I am growing is perennial, although there are annual and biennial types as well. They grow 4-5 feet tall and are frankly a bit rangy, but like the awkward kid in the elementary school class picture, they can be stuck at the back of the border to peek over the heads of their shorter, more picturesque classmates. These plants, like their borage relatives, are said to be attractive to bees (they like the blue color), and are a food source for butterfly larva (another good reason to stash them at the back of the border, where any chewed leaves will be less noticeable). Anchusas like it hot and dry, conditions that I can provide in summer, although there is some question as to how well they’ll cope with summer humidity. As often happens when I research a plant’s site requirements, it seems I can find few definitive answers to my questions. With Anchusa, it appears that some strains of the plant ask very little of the gardener by way of environmental accommodation: Any place with a bit of sun will do. Others seem persnickety, wanting silty, free-draining soil but constant moisture. Some reseed politely, some can only be propagated by cuttings. It seems like a typical first date: I’m not quite sure what to expect. It probably won’t be anything like what I imagine. It may be better, or it may be worse. I’m willing to give it a little grace, however. All good long-term relationships must begin at the beginning. 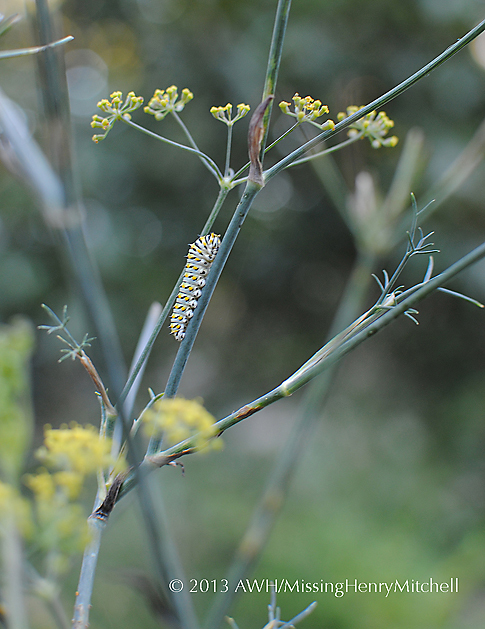 A fascinating fact about why birds don’t eat monarch larvae. Check out other recommendations from Dr. Douglas Tallamy about important species to plant for butterflies, moths, and birds, and learn more how home gardeners can support monarch populations in their migration and recovery. This is a great project for families, after-school groups, or faith groups to tackle. Every bit helps. Large-scale farming has wiped out millions of acres of native plants, including milkweed, a vital resource for monarch butterflies—contributing to their dwindling numbers. Here’s the scoop and how you can help. An important top ten list for the year, part 2: Important herbaceous host plants for butterflies, moths, and birds. 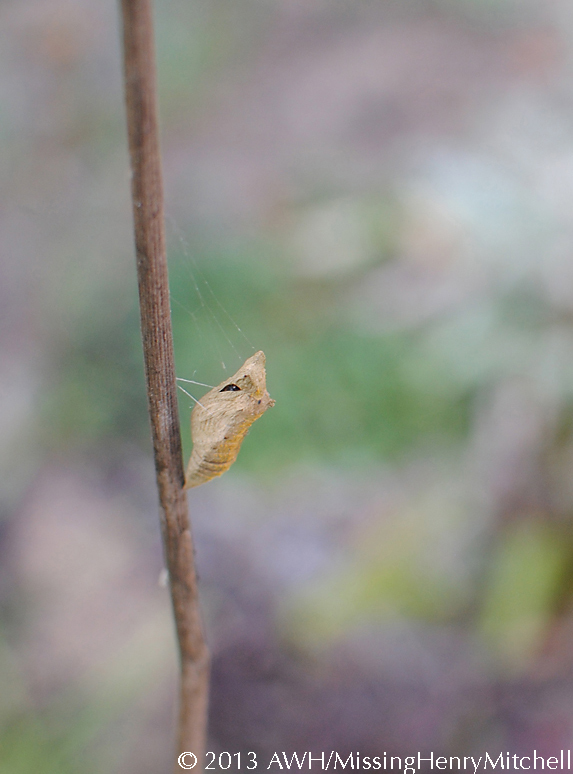 Yesterday I wrote about the top genera (all of which happen to be woody) that are important for hosting Lepidoptera species (butterflies and moths). I was astonished to see that Quercus (oaks) are critical hosts for 532 total species of Lepidoptera, 518 of which are natives. I’m feeling pretty chuffed: My half-acre suburban lot contains 26 oaks, one hickory, and three blueberries, all of which make the top ten. But not everything in the landscape is a woody plant (though sometimes around here it feels like it). What herbaceous genera are important hosts? Zea (corn, maize): 120 species. Interestingly, of those 10 best herbaceous genera, 4 (Zea, Taraxacum, Medicago, and Brassica) are alien to the US. Clover and alfalfa are common cover crops. The Zea, Fragaria, Brassicas, and Phaseolus genera are very common agricultural crops for home gardeners, and Taraxacum is growing in popularity as an agricultural crop, albeit in very niche markets. All this points to the importance of using organic methods in the garden. But moreover, we need to be mindful that the foods that sustain humans are also critical support for insect and bird species we not only enjoy, but also rely upon: They pollinate our crops, and they keep other, more problematic insect species under control. 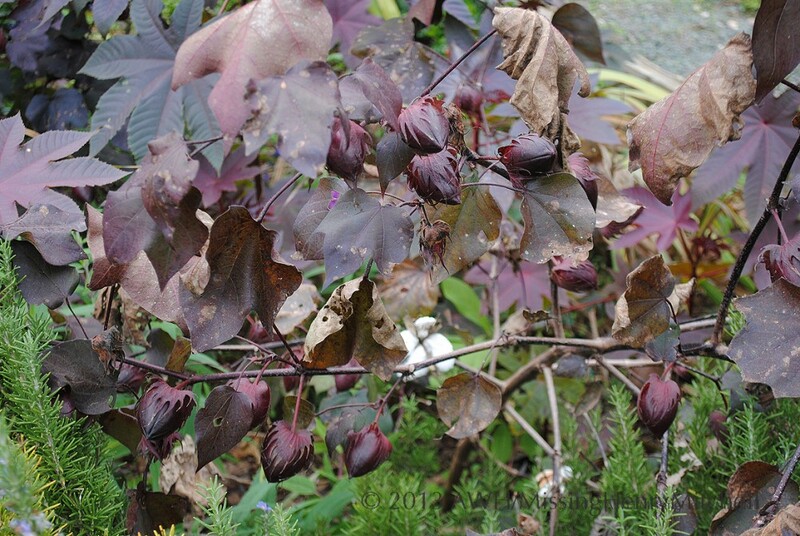 And since some species of the important host plants are classified as invasive (including certain Acers, Ambrosias, Brassicas, Plantagos, Polygonums, and Solanums), it’s important to pay attention to the scientific name of what you’re planting. This year I’m going to embrace my role as part of the ecological circle by planting an extra row or two of these crops to let the caterpillars and butterflies enjoy. I will keep a row for the hungry near my own food crops and protect those with floating row covers; I’ll plant the others in a sunny spot away from my food crops. I hope you’ll consider doing the same. We all love a list, I think, as long as it is not a list of chores to be done. Particularly fun at this time of year is a list of plants we wish to add to our gardens in the season ahead. I have lists of seeds I want to grow, lists of plants I want to move, and lists of projects I want to tackle in the garden. Last week I came upon a list that made me sit up. It was first published in 2009, and I wish it were better known than I think it is. Douglas Tallamy, professor of entomology at the University of Delaware, published a study describing the impacts of planting nonnative genera in the garden and in the urban/suburban landscape in particular, on insect populations and the implications for life up the food chain. I am embarrassed to admit that, while I believe in and use organic gardening principles and try to employ conservation methods for pollinators, I had never given much thought to the larger ecological interconnections. 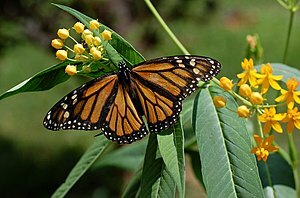 I’m growing Asclepias (milkweeds) this year because I’m concerned for the welfare of Monarch butterflies, and every little bit of effort helps. I try to relax when I see caterpillars making feasts out of fresh green leaves, because I know those caterpillars will grow into moths or butterflies. And those guys will pollinate my plants, plus they’re pretty to watch. Songbird populations are on the decline nationwide due in part to the inclinations of housecats let loose in the garden for the day. Compound that with habitat loss due to development, climate change, and the additional pressures presented by landscaping choices (however benign the intentions behind those choices may be), and it adds up to substantial challenges coming from all corners. Tallamy’s list uses Lepidoptera (butterflies and moths) to stand in for all herbivorous insects, because data on them are plentiful and they represent a substantial food source for birds. But understand that if you have these plant genera in your garden, they’re benefitting more than butterflies and birds. What beneficial choices can gardeners make to help sustain not only pollinators, but birds as well? 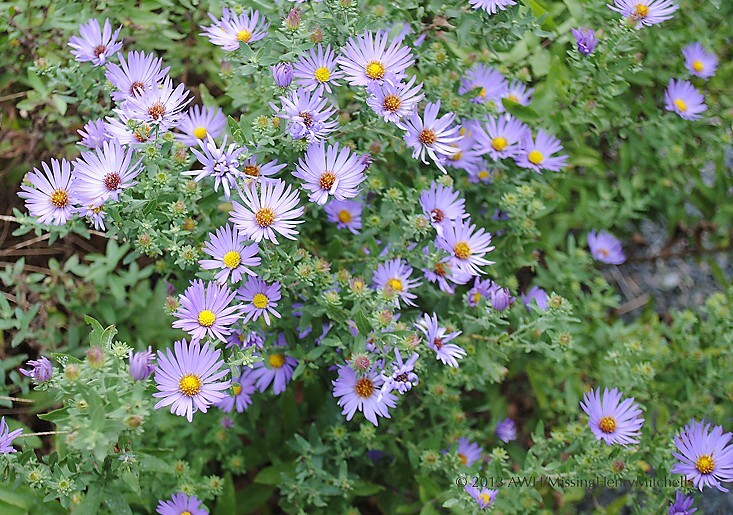 While the ten best all happen to be woody plants, herbaceous plants are also on the list. Tomorrow I’ll outline the best herbaceous host plants. Consider studying Tallamy’s full list before you begin your plant shopping this spring. Now that fall is here, and life in the garden is beginning to slow down (ever so slightly), I am thinking about next year’s garden. It’s been a wonderful summer here for swallowtail butterflies. 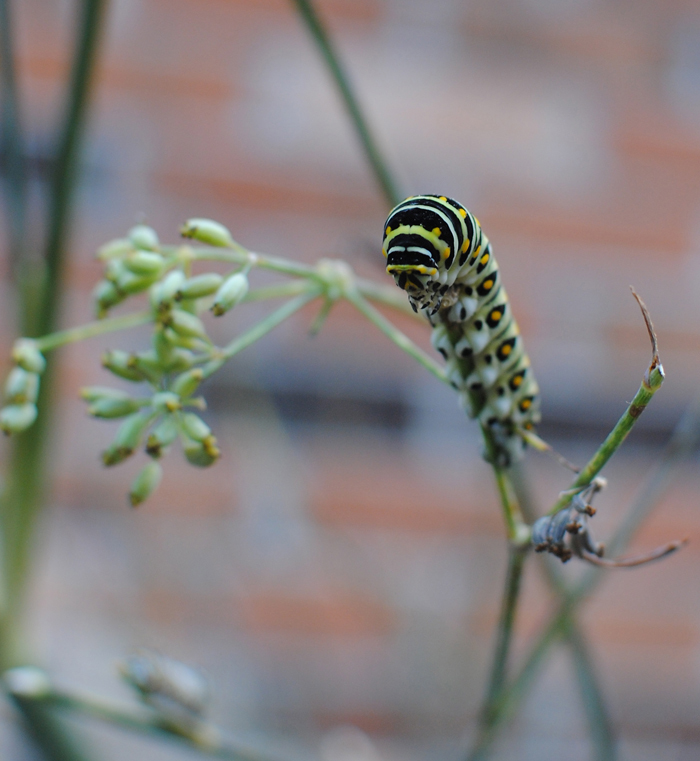 I enjoy spotting the caterpillars that continue, even now, to overwhelm my small stands of bronze fennel (one of the construction workers building our addition said he counted 19 on one plant last week!). 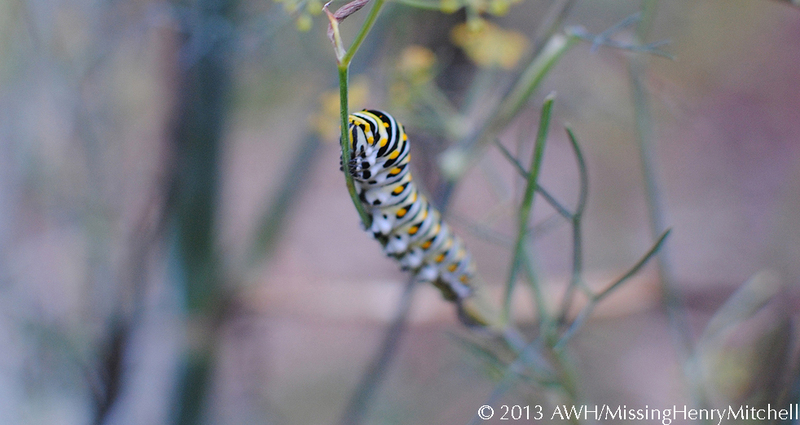 A very hungry swallowtail caterpillar munches my bronze fennel to its core. But as you may have heard if you live in the US, this has been a bad year for monarch butterflies (Danaus plexippus). Habitat destruction and widespread use of pesticides have contributed to profound declines in numbers over the past few years. 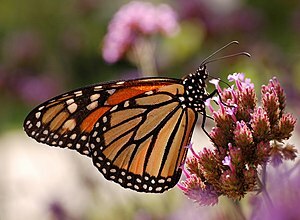 In the past, I have tried to grow plants attractive to all kinds of pollinators, but as I plan for Winter Sowing 2.0, I intend to sow and plant for monarchs in particular. Monarch larvae feed on milkweed (Asclepias sp. 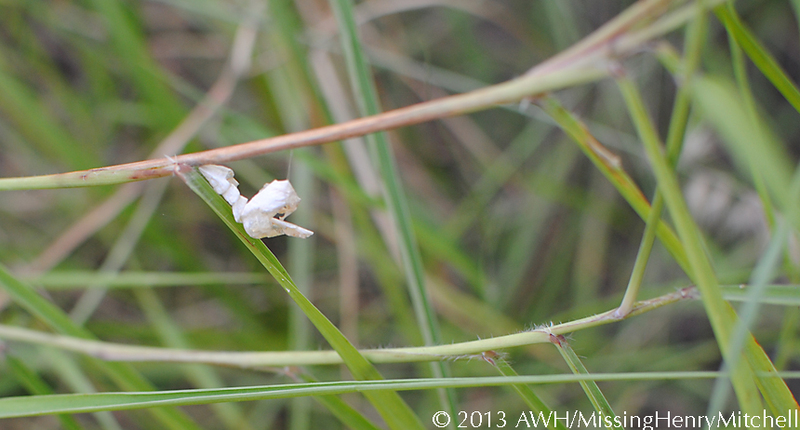 ), and females will only lay their eggs on these plants. Different species of milkweed are recommended for different areas of the US: Monarch Joint Venture has a map and fact sheet about them. But migrating butterflies need nectar plants as well. Monarch Watch is a wonderful source of information on ways to help contribute to conservation of this species (as well as other butterfly species), including recommended nectar plants. I think my household may try to become certified as a Monarch Waystation next year (I feel a Girl Scout project coming on). Many milkweeds species perform well with winter sowing–a technique in which the gardener sows seed in a simple pot or flat and leaves it exposed to the elements all winter long. The gardener doesn’t tend the seedlings until it’s time to pot them on. It couldn’t be easier–so there is little excuse for me to not try to help this beloved and charismatic species recover from the challenges it has suffered. I hope that, if you garden in North America, you will explore resources like Monarch Watch and Monarch Joint Venture to find out ways you can help. There are wonderful citizen science programs around through which gardeners and homeowners can assist with migration tracking and population counts. No garden is too small to contribute to the conservation of these creatures. I had thought the caterpillar season was over. 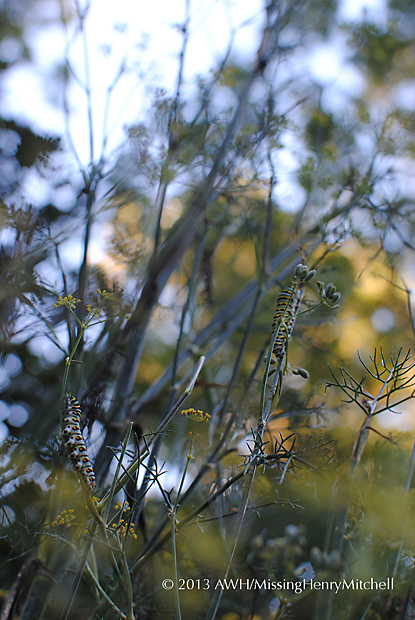 As I was weeding the blue slope the other evening, I noticed tons of them on the spindly remains of my bronze fennel. This is the caterpillar of the eastern black swallowtail butterfly, Papilio polyxenes. There must have been ten or so, ranging from fat ones like these to tiny ones perhaps three quarters of an inch long, on one plant alone. With any luck, I will have a second chance to watch a chrysalis. Chatham County Extension Agent Debbie Roos has noticed the same phenomenon in her nearby pollinator paradise garden. By the way, she has a terrific list of butterfly- and bee-friendly plants at this site. I think bittster was right: holes in the chrysalis aren’t good. I have given up hope that this one will emerge. The chrysalis is getting more and more brittle, and I can see through a small slit that there is something inside, but it doesn’t look like it’s alive. All the close-up, watchful examination of the site did reveal a successful one nearby, though. At first I thought it might be a dragonfly exuviae (Scrabble word! ), based on the ribbed appearance of the end near the stem, but I think it’s just a bit too far away from the pond for this to be likely. 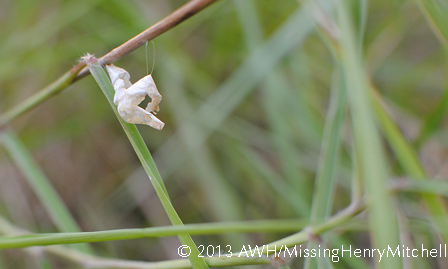 It has the thin threads attaching it to the stem, typical of a chrysalis. Also, it seems that exuviae generally survive more intact than this; if it was an exuviae, it has taken quite a beating. At any rate, it’s good to know that one of them made it. Wish I could have been there to see it, but maybe next time.